This is one for the Spinal Tap fan in your life: for starters, this replica Marshall guitar amplifier digital radio has volume dial that goes up to eleven. Honestly, only a hugely confident and recognisable brand like Pure could pull this off. This isn't just a makeover though. Pure has also tweaked the Evoke-1XT as well as dressing it up. 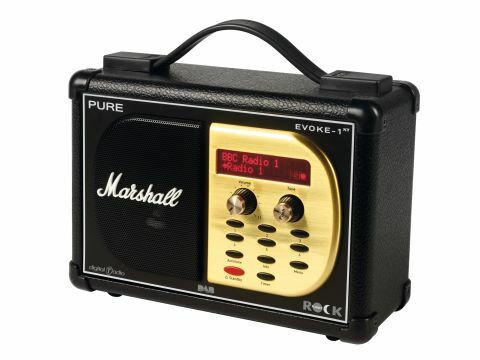 Instantly obvious is the involvement of Planet Rock - the Evoke-1XT tunes into that station the first time it's switched on although, thankfully, doesn't return to it unless asked. The rear of the unit has remained identical. There's a USB input (for software upgrades from Pure's website only), an optical digital output, a stereo output and an output to an auxiliary speaker. The latter is useful if you're after better stereo, because Pure also manufacture an optional standalone speaker in the guise of the £30 XT-1. Operation of the unit is easy. The DAB stations tune in immediately and there's also a dedicated control to perform another scan if the unit is moved. In a well-designed operating system, the retro-style tuning knob, which can be turned to toggle through all available DAB stations, also acts as the 'OK' key. Scrolling through menus - such as setting alarms, recording stations or setting favourites - can be confirmed by simply pressing the same button inwards. However, there are no advanced features, such as SD card slot, MP3 playback or recording/pausing/rewinding action. Sound quality is excellent from its mono speaker. A blast of Planet Rock reveals a bass-heavy and precise delivery that's adequate at this size. Spend £100 on any other DAB radio and you may get stereo and pausing capabilities, but Pure's brand of reliability and build quality? Probably not. And, as Nigel Tufnel would say, it's one louder, isn't it.